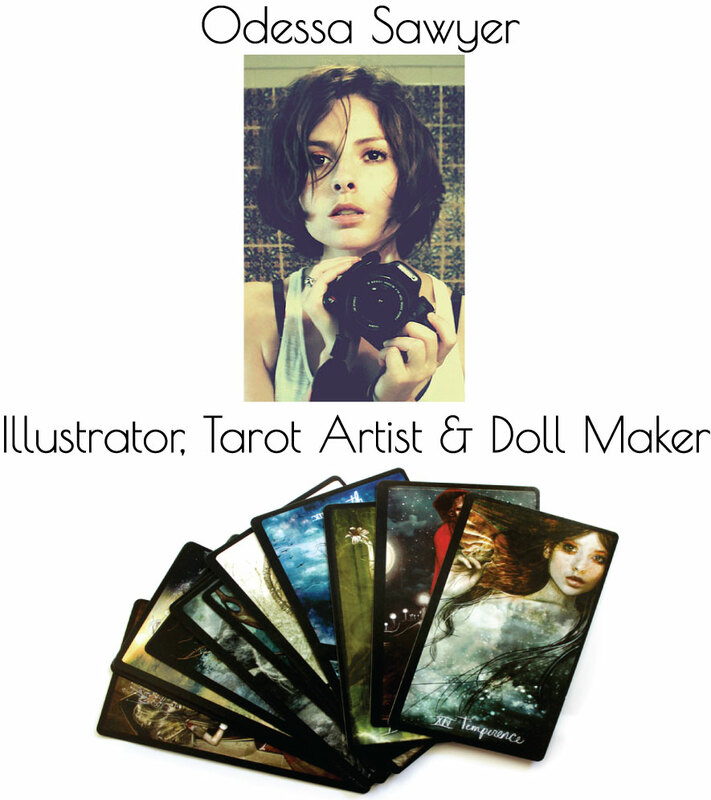 Today we have renowned Illustrator, Doll Maker and Tarot Artist, Odessa Sawyer in The Tarot Hot Seat. Odessa is a multi-talented creative artist who has an extremely impressive resume to her credit. Her artwork has adorned the book covers of several top publishing houses. HBO, Laika, Duck Studios and Coty have all commissioned Odessa’s fantastic artwork. Her work has been published in Lurzer’s Archive where she was listed as one of the best illustrators worldwide for 2011 and 2014. No mean achievement I am sure. Odessa’s bio highlights where she derives her inspiration from. Fantasy, fairy tales, fashion and classic horror are her main influences which are given superb creative expression in her quirky and imaginative illustrations. A visit to Odessa’s website will reveal how extensive her portfolio is. Read through her resume for yourself, even Katy Perry’s name crops up. Odessa’s illustrations are sublime and totally original. Hers is a talent not often seen. It is not surprising how much she is in demand. What comes as a fascinating surprise is the discovery of a complete set of Major Arcana Tarot Cards which Odessa has given great attention to in their detail and design. Images of the full 22 cards are available to view on her website. I think you will agree they are magnificent. Odessa is also a Doll Maker, her creations crafted mostly from recycled fabrics and every bit as quirky and whimsical as her illustrations. With such an extensive range of superb work to choose from, it would be hard to settle on any one piece to purchase – I want them all, and especially the set of Major Arcana! Ooh and lots of dolls too! Odessa works mainly in digital mixed media, utilizing digital and traditional painting and photography. Her website has an online shop full of stunning artwork treasures. From here you can purchase dolls, digital work, books, cards and prints. Odessa also accepts private illustration or doll commissions. 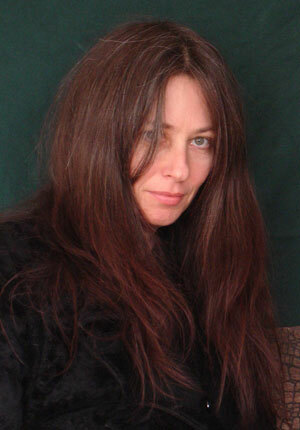 Odessa Sawyer lives in Santa Fe, New Mexico with her husband and son. Me – Odessa, can you tell me where your gift or talent for art comes from? Were you always drawing, painting and making things as a child? Where did you, if at all, study art? Did you always want to be an artist? Odesssa – “Both my parents are artistic so there was a big emphasis on creativity in the house growing up. My mother is a fine artist who can work any medium and my father was a really unique architect who traveled around the country creating homes for actors and rock stars. Me – Would you consider yourself a typical artist, quirky or bohemian? Me – How critical are you of your own work? Me – When I first discovered your work after doing a google search for High Priestess images, and then followed the link to your website I expected to find a site dedicated to tarot. What I didn’t expect to find was a cornucopia of illustrative delights and funky doll craft. There in the middle of it all was a stunning collection of Major Arcana Cards. I read through your bio in search of some reference to tarot, but there was none which leads me to enquire as to what drew you to creating this powerful deck? Why tarot? Me – I notice many artists with non-specific interest in tarot have tackled these cards at some stage or other. Some may be drawn to painting their interpretation of a certain card, while others go for several, especially the Major. It seems only tarot die-hard artists go for the full deck. Did you have a knowledge of tarot at the time you began work on them, or did you learn it along the way? Me – Was it necessary to carry out research on each card before starting work on them? Me – Many artists use the interpretation of a Tarot card for inspiration in design. Tarot’s symbolism helps develop their artistic expression. What initially started off as an exercise or experiment has sometimes turned into a growing passion for Tarot. This has caught many by surprise. What are your feelings on this and how did the creation of your Major Arcana affect you? Me – Designing and creating a deck of Tarot can be an exhausting process, sometimes taking years to research and complete. How long did it take you to complete this series? Did you start with The Fool and work from there, or did you approach it randomly? How did you keep motivated? Me – You haven’t named your collection of Major Arcana. Do you intend to? Me – Your inspiration comes from fantasy, fairy tales and a type of classic horror. The Tarot certainly lends itself to such an influence, with many tarot cards of old depicting highly imaginative and often grim imagery. In such an environment, you could let your imagination run riot. Did you feel this project landed you right in your element and the realm you are most happy working in? Was it a no-brainer for you, something that had your name and style written all over it? Me – With your fascination for horror, did this naturally lead you to immerse yourself in the design of the more disturbing cards such as Death, the Devil and the Tower? Did you find the grim cards enjoyable to paint? Did they play to your love of horror? Me – Now that you have completed the Major, which card/s are your favourite/s. Me – Now I think all the cards are outstanding individual works of art, but I want to mention a few here. I feel you have portrayed The Magician perfectly. He is vapoury and quite possibly just an illusion, showing us only what he wants us to see. He is a Magician after all. The Fool as the blindfolded circus acrobat indiscriminately tossing daggers in the air. She sits precariously on a swing, not bothering to hold on. She has no fear of plummeting to her death. Then there is the High Priestess, cocooned in layers of suspense, keeping her true self under wraps. What lies under her veils no one yet knows. Only the privileged and worthy will eventually get to see. She is depicted in virginal white, yet the red rose of her crown and red pendant reveal a burning passion that grows within, and will at some stage need to be expressed. At present her rank and position do not permit her such freedom and she must patiently wait. The red rose that crowns her head is seen once more on The Empress where it stylishly adorns her hair which flows freely around her. As the artist, can you explain to our viewers the symbolic aspect of this? Me – The Empress is depicted nurturing three eggs, the Emperor, several more. Is the Empress concealing these extra eggs in the nest or does it highlight the different levels of responsibility between them? The Empress must guard her eggs, but The Emperor must also guard the eggs of all his kingdom. The Empress has direct responsibility for the safety of her own eggs, but the Emperor’s is broader and extends to the eggs of others too. However, the extra eggs in his nest could imply he has been busy spreading his seed!! Could you share with us the significance, if any, regarding the differing number of eggs involved? Me – Now I think Strength must be one of my favourite cards in your collection. It is both beautiful and bloody at the same time, victorious and tragic in turn, a true grim fairy-tale which I can’t help but love. The poor lion has been defeated and tethered and a crown placed upon his head. Is this an attempt to domesticate him, to make him a fashion accessory rather than allow him run wild and free? There appears to have been a major struggle to subdue the lion and one would not have put their money on the young princess emerging victoriously. She looks too refined, too delicate for the job, but looks are deceiving, and I am sure the lion thought it would be a walk-over. After all, he is so much bigger and stronger than she. The young Lion looks humiliated, and the princess in a state of shock at the outcome. Blood was spilled in the struggle, but it just goes to prove, physical strength alone is no match when compared to inner strength. The young princess for all her delicate appearance obviously has inner strength in bucket loads. Odessa, I would love to hear what you intended to convey in the imagery of this card? Me – Similar to other tarot artists I have interviewed, I notice your likeness in several of the cards. I see you most definitely in the Empress, Temperance and other cards too. Was this intentional or a habit most artists have? Me – Do you have a guide-book to go with your cards? If not, do you have plans to create one? Me – Which Major and Court Card do you most identify with? Have you deliberately painted yourself into any of the scenes? Note – you may have already answered this in a previous question. Me – Of the cards you have painted, which would represent your life right now? Me – How much has your understanding and knowledge of Tarot grown since you worked on your first card? Me – What message, if at all, do you hope to communicate through your tarot artwork? Me – If you were to start a new Tarot deck or collection today, would you approach it in a different manner? What have you learned along the way? Me – How did you get your Major Arcana Series out there? Do you need an active online presence, blog, social media? Me – You must be very proud of what you have achieved so far. 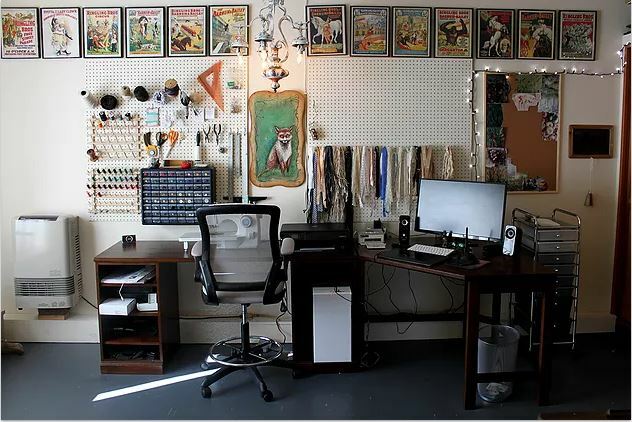 I see from your blog post you have a fabulous new studio and shelves to eventually put all your published work on. It looks so interesting. Congratulations. Where did you work from before? I get the impression this is an Odessa Only Zone, your den, where all your wonderful ideas and creative impulses come to life. You must be very excited to have a lovely place to work from. Was it long overdue? Oh, and that Fox wall hanging is magical. Is it one of yours? 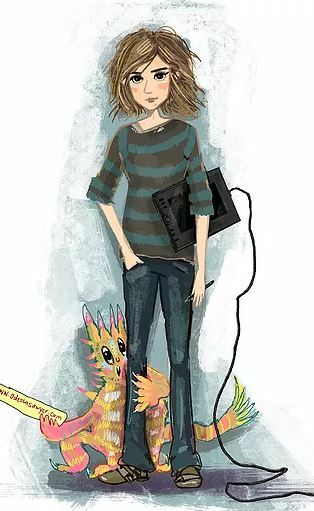 Me – You did some incredible illustrations for the New Mexico Magazine. What sort of project do you enjoy working on the most? Me – Was it exciting working on album covers? Where you given a definite spec or allowed come up with your own ideas? Me – You have an amazing collection of prints which can be purchased from your site. Your artwork has a very broad appeal. They are incredibly detailed and colourful. Where do you start when painting such fantasy scenes? Do you visualise it first, see the picture in your head and then communicate it to canvas? Does it always turn out as you first imagined, or does it evolve as you paint? Me – Your dolls are incredible and so original. I do have some favorites. I love Bobby (Good Heavens, what happened to poor Bobby, his poor arm is in a sling, not to mention his eye patch. He has been through the wars!) Bride and Pearl. Madge the Button Thief is adorable too. And what can I say about The Twins! On average, how much would one of your dolls cost to buy? And commissions? Me – You are obviously a very busy woman and artist, but do you have any non-art interests or hobbies? Me – So, what’s next for Odessa Sawyer? Thank you Odessa Sawyer for taking The Tarot Hot Seat and giving your time to answering all our probing questions. We were very excited to hear about all your fascinating work and to get a glimpse behind the scenes of such a talented illustrator and crafts-person. We wish you the very best of luck for 2018 and know it will be a wonderful year for you.